Colts running backs failed to impress, as they showed little ability to create on their own. Focusing in particular on the first half, Robert Turbin broke a tackle on each of his first two runs of the game but fumbled on the third, and the unit collectively did not break a single tackle afterward. Quarterback Phillip Walker flashed an intriguing skillset in the second half, as he made a number of impressive throws while also showing off his athleticism. His best throw was a perfect deep ball fit between a corner and safety in solid coverage that was actually dropped by his receiver, and he also registered a 16-yard scramble on which he fell down in the backfield, got up before being touched down and outraced the defense to the edge. Interior defensive lineman Hassan Ridgeway had an active and effective first half, as his quickness off the snap was tough for Bengals’ offensive linemen to handle. He was a part of multiple stops from the back side due to his ability to beat his man inside and avoid cut blocks. The defensive interiors of the Colts continued to dominate the line of scrimmage in the second half. In particular, Rakeem Nunez-Roches was able to immediately bull rush him into the backfield to either make a defensive stop or force the runner to change the point of attack when lined up against Bengals reserve center Brad Lundblade. Offensive line woes continued, as the Bengals’ lack of depth was again an issue. Cedric Ogbuehi surrendered multiple pressures in the first half, and T.J. Johnson struggled in the run game at both center and right guard. Jeff Driskel saw extended action due to Matt Barkley‘s early first quarter injury and took particular advantage on a strong two-minute drill to end the first half. He worked the boundaries and used his outlets efficiently, and while he missed fitting a deep shot between a trailing corner and safety on the right side of the end zone, he redeemed himself by striking a perfect ball on the last play from scrimmage in the half for a touchdown down the left sideline. Malik Jefferson flashed his athleticism and instincts in coverage tonight, as he twice knocked passes away by dropping back and effectively locating throwing lanes. The first occurred in the end zone, and the second was an impressive drop and adjustment outside the hashes about 15 yards downfield. Josh Tupou was an immovable nose tackle at Colorado and showed just why tonight. He had a big first half, as he stacked his man at the line of scrimmage multiple times for big run stops. 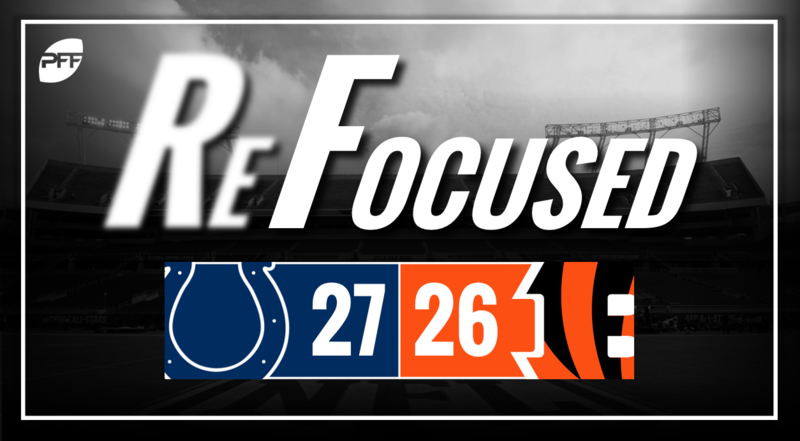 Indianapolis: The late passing attack for Indianapolis was the key in this one as the reserves in Cincinnati were unable to keep passes in front of them in the fourth quarter while allowing Walker to flash his worth. Cincinnati: Cincinnati’s inability in coverage late in this one is what ultimately sealed their fate.